HOME > Products > BREATHAIR® > What is BREATHAIR®? 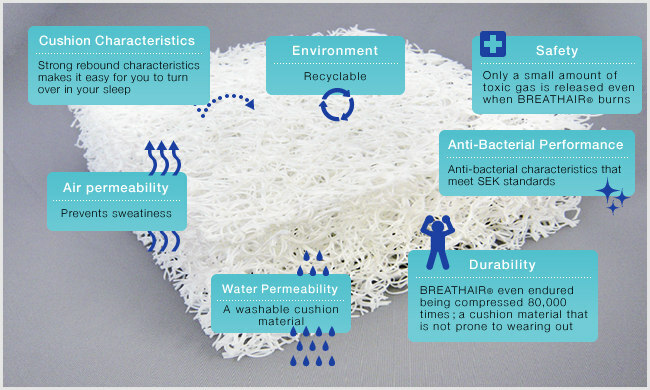 BREATHAIR® has many characteristics: air permeability, cushioning characteristics, water permeability, durability, safe, antibacterial properties and kind to the environment to name but a few. Mattresses and pillows made with BREATHAIR® are not prone to sweatiness and this makes it easy for you to move around and turn over in bed at night. BREATHAIR® bedding allows you to sleep as much as you want in comfort. Moreover, BREATHAIR® is widely used in hospitals and care facilities because it is easy to wash and also conforms to SEK standards* to limit the propagation of bacteria. Due to its excellent durability, BREATHAIR® has been adopted for use in the seats on N700 Series Shinkansen trains as well as other train lines and motorcycle seats. Furthermore, a number of artists have discovered that the complex structure of BREATHAIR® is not something that can simply recreated using computer graphics and so BREATHAIR® is increasingly being used in the fields of art and design. BREATHAIR®: a cushion material with limitless possibilities. 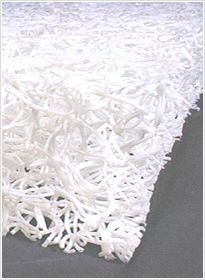 *SEK standards are set by the Japan Textile Evaluation Technology Council. SEK standards guarantee the anti-bacterial performance of finishing agents and finishing products.